Is LottoNow a Scam or Legit? Read 4 Reviews! Playing syndicates can be good fun, especially where the share ratio increases the opportunities of winning. That is the big idea of syndicates – more tickets shared between a bunch of people. 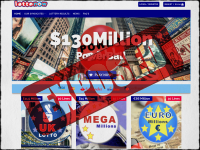 LottoNow offers six international lottery syndicates. The site is very straightforward with no complicated discounts or VIP points. But, let’s go take a look at what their share ratio is. That’s one of the important parts of deciding where to play a syndicate. There are six lottery syndicates that players can opt into. Powerball is played twice a week with 120 shares for 35 tickets at €4 per share. Mega Millions also has a 35/120 ratio at the same buy in. UK Lotto includes the Millionaires Raffle with 20 lottery lines and 120 shares at €3 per share. EuroMillions and EuroJackpot has 30 lottery lines with 120 shares at €3 per share. Spain’s La Primitiva is also 30/120 at €3 per share. LottoNow.com appears to randomly pick their syndicate tickets. I like that the lottery lines are all over the place and they don’t use a specific system like the same base ticket line with different bonus ball numbers. Players get to see the actual lottery tickets that form the syndicate they are buying into before they click “buy”. They are posted online. Players can choose either the next draw or (depending on the timing) both weekly draws where that is available. There is no other multiple draw or subscription facility. There are no bonuses for multiple purchases. We’re still not sure if the “out of stock” refers to a full syndicate or that the lottery draw has closed for purchases. Who Can Play at LottoNow? The only limitation in the terms and conditions is that people how are a citizen or reside in the United States can’t play. There doesn’t seem to be any other restrictions. Players are responsible for any taxes, etc. that apply in their own country. If you’re going to cash out your account, you have to have a minimum of €30.00. LottoNow gets to choose how you get your money though they say they will try and “accommodate” your choice. There is no information on how long this takes and there could be delays due to a security review. They say there is no commission charged, though there might be fees and costs on collecting and sending your money. LottoNow.com is registered in Spain with an email and snail mail address, phone number and “support” pop up window. There is no info on when they are in the office or how long it will take to get your answer. Speaking of which, we did ask the big question to LottoNow.com’s support. Spain takes 20% tax on winnings over €2,500/$3,425. So, it the company is registered and operated from Spain, does that mean they take the tax on all winnings. We’re still waiting for an answer. Make sure you type the website address correctly. If you drop a ‘t’ from the word lotto, you will end up at lotonow.com which is an equal housing opportunity site out of California. This is a lottery syndicate site for six games. Sorry folks. With a share ratio of 120 to 30 to 40 lines, this just doesn’t work for me. I’m looking for syndicates that offer at least an equitable amount of shares to tickets. Having said that, the buy in price does make it attractive, but it would take winning the jackpot to make it worthwhile. LottoNow.com gets a thumb’s down. When I’m playing in a syndicate, I am definitely looking for more ticket lines then what is offered here. Beware, I was a member for a few months and played Euromillions regularly. Won nothing, just a few cents here and there – and I mean a few cents credited to my personal Lottonow account. No way of verifying winnings and how the sum of 25 cents was calculated! Then, Lottonow started debiting this account for no reason, and I ended up with a negative balance even though I had not purchased anything! The first amount was refunded into the account when I complained and was apparently due to a ‘technical problem’ – then it happened again – I closed the lot down. This whole business lacked sufficient transparency for me I’m afraid. I have an account with Lottonow and their main difficulty is that of communication. I have looked all over their website and cannot see a ‘button’ that allows you to chat with them, let alone call them. My main problem is actually that I cannot get their website to accept any of my debit or credit cards which are all legitimately form different UK banks. Having spoken to my banks, they all say that it is the site which is declining my cards. I would dearly like to speak to an English speaking human voice to try and sort this out. I am a resident of Spain – but I have a UK passport. A very nice, clean simple site. Some good lotteries on offer, no, not the biggest number of lines, but look at the pricing! So fits my budget. Good customer service, simple payment. Am a regular player. I tried using 2 different cards for my entry both rejected. Lottonow could not help me to solve this problem.